Owners of yachts and motor cruisers are well aware of the difficulties of meeting the demand for electricity on board their vessels. Today’s yacht is usually equipped with a wide range of electrical and electronic equipment designed to make life on board safer and more comfortable. The power to run these items is drawn from the batteries. Batteries lie at the heart of all ‘off grid’ systems. Batteries store electricity in the form of chemical energy. It is important to realise that the ability of the battery to absorb or deliver current is limited by the pace at which the chemical reaction within the battery can occur. A typical installed battery capacity is 300-400AH.As batteries should not be routinely discharged beyond 50% of their capacity this means about 200 AH is actually available for use. In practice many yachts owners do find they use 150-200 A hour per day when cruising i.e. 100% of the batteries available capacity. Therefore they face a daily engine run of 3-4 hours to replace the lost charge. However this approach will only return the battery to about 80-90% charge, and if this regime is maintained over time the batteries function and service life will diminish. Batteries need to be returned to 100% charge on a regular basis to remain healthy and this requires relatively small charging currents to be applied for extended periods. Wind generators and PV panels can do this job very well. They will also offset power use when the owner is aboard, extending the periods between routine charging. The DuoGen wind/ water generator is exceptional in that it is easily capable of providing all the electricity needed on passage when in its water mode. At boat speeds of 5 knots plus many owners find they do not need to run their engine or gen set at all for battery charging. 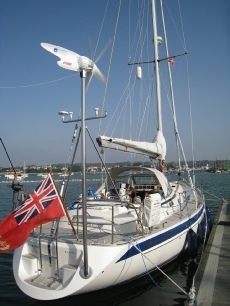 Where your typical sailing comprises coastal passages of less than 24 hours duration a dedicated wind generator such as D400 would be a sensible choice. This pattern of sailing tends to include an engine run at the beginning and end of each day. Also when sailing marina to marina shore power is usually available, and therefore the primary need for energy occurs when anchored off. At anchor the D400 dedicated wind generator is capable of producing 180amp hours per day in a 15 knot breeze, and over 380 amp hours in a sustained force 6. However no wind generator is at its best when a yacht is underway. Where possible the yachtsman will be sailing with the wind on or abaft the beam. 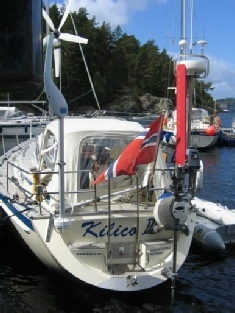 This means the wind velocity available to the turbine is effectively reduced by the yachts speed. As there is a cubic relationship between wind speed and the energy it contains, this means outputs from a wind turbine are often low when on passage. That is unless the owner’s preference is to beat to windward at every opportunity! Also the yachts motion generates gyroscopic forces within the air rotor which prevents the turbine from pointing to the wind as accurately as normal. Despite these factors D400 will still make a useful contribution when a yacht is at sea, but really comes into its own when anchored or moored. 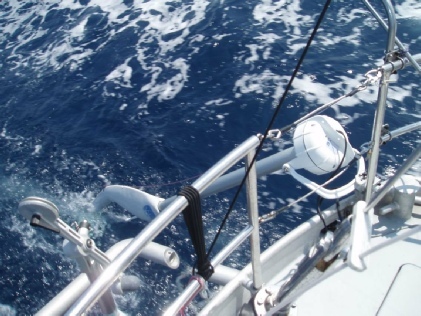 If you sail long distance or have plans to do so, water generation is indispensable. DuoGen is a highly efficient water generator capable of providing all of yachts electrical power on passage. Boat speed losses are minimal and DuoGen converts quickly and easily to wind generation mode at journey’s end. DuoGen is unique amongst combined wind and water generators in terms of performance and utility. The logic of deploying the water mode is that once under sail DuoGen uses a proportion of the energy captured by the yachts whole sail plan, rather than relying on one square meter of air rotor. Therefore in most conditions the output from DuoGen in water mode will far exceed that of a dedicated wind generator in the same circumstances. Also as water is 800 times denser than air relatively large amounts of energy can be extracted using a small impeller which keeps drag and boat speed loss to a minimum.